One of the things I want to do with this blog in the new year is add reviews of other hunting related web sites. Well, it’s the new year, so here’s our first review. I was turned on to this site by my hunting buddy and co-blogger, Keith. 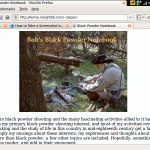 The name of the site is Black Powder Notebook and it chronicles the adventures of Bob Spencer as he sets out to hunt and camp as our forefathers did as this country was being founded. He strives to re-enact exactly as a late 1700’s homesteader or pioneer would have hunted. He has logged many of his treks through the years and it’s very entertaining reading. One of my favorite stories is Squirrel Stew, a story about an overnight trek where he describes the entire trip. It sounds so peaceful and relaxing, enough so that I envy him. I would really love to experience the outdoors in that way. Along with his hunting stories are some black powder related articles on loads, shooting, fire making, tomahawk throwing and casting round balls over a camp fire (which is another thing I’ve been wanting to try my hand at). This is a great site to get in the mind of a hunter and outdoorsman. It’s refreshing to read about someone who enjoys being out in nature more than just bagging a trophy buck. It’s a feeling we attempt to reach at our deer camps as well, but I think Bob has us beat, by a really long shot. Even if you’re not into black powder hunting or shooting, this site is a definite must read. I was turned on to this site by my hunting buddy and co-blogger, Keith. 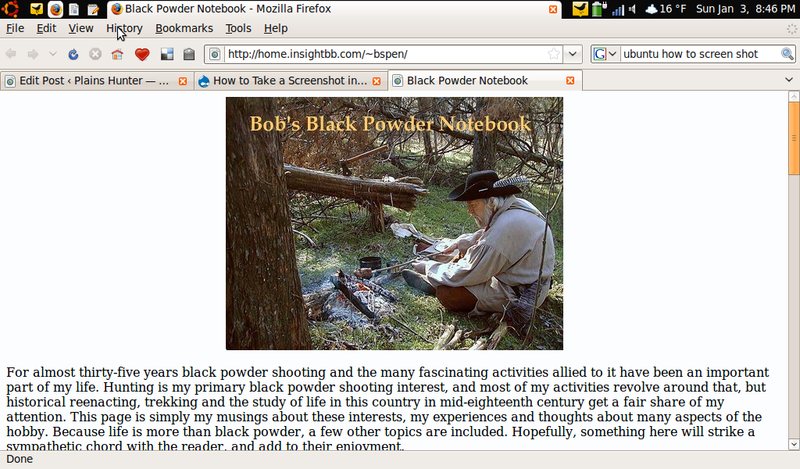 The name of the site is Black Powder Notebook (http://home.insightbb.com/~bspen/) and it chronicles the adventures of Bob Spencer as he sets out to hunt and camp as our forefathers did as this country was being founded. He strives to reenact exactly as a late 1700’s homesteader or pioneer would have hunted. He has logged many of his treks through the years and it’s very entertaining reading. One of my favorite stories is Squirrel Stew (http://home.insightbb.com/~bspen/squirrel.html), a story about an overnight trek where he describes the entire trip. It sounds so peaceful and relaxing, enough so that I envy him. I would really love to experience the outdoors in that way. Along with his hunting stories are some black powder related articles on loads, shooting, fire making, tomahawk throwing and casting round balls over a fire (which is another thing I’ve been wanting to try my hand at) (http://home.insightbb.com/~bspen/runningball.html). So, this is a great site to get in the mind of a hunter and outdoorsman. It’s refreshing to read about someone who enjoys being out in nature more than just bagging a trophy buck. It’s a feeling we attempt to reach at our deer camps as well, but I think Bob has us beat, by a really long shot. Even if you’re not into black powder hunting or shooting, this site is a definite must read.